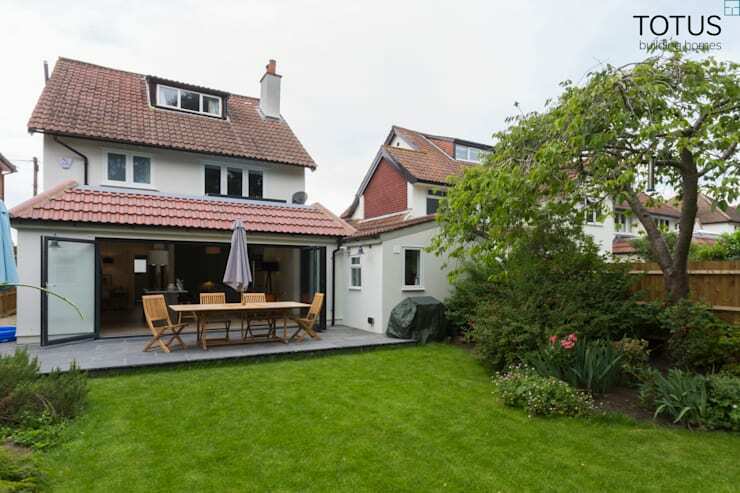 This characterful 1920s property was completely renovated by the professionals at Totus Construction, who also extended the property to allow for a wonderful open-plan living space, which flows out to the garden. 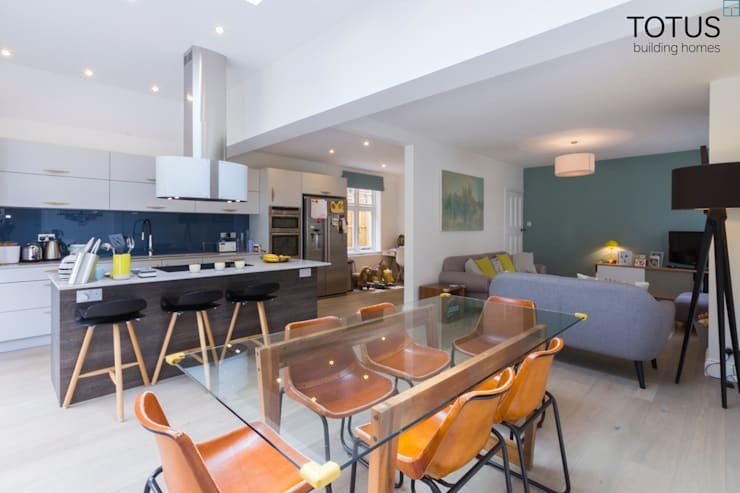 Maintenance work included installing new heating and electrics, whilst changes to the interior included a new kitchen, new floors throughout and stylish modern décor in every room. 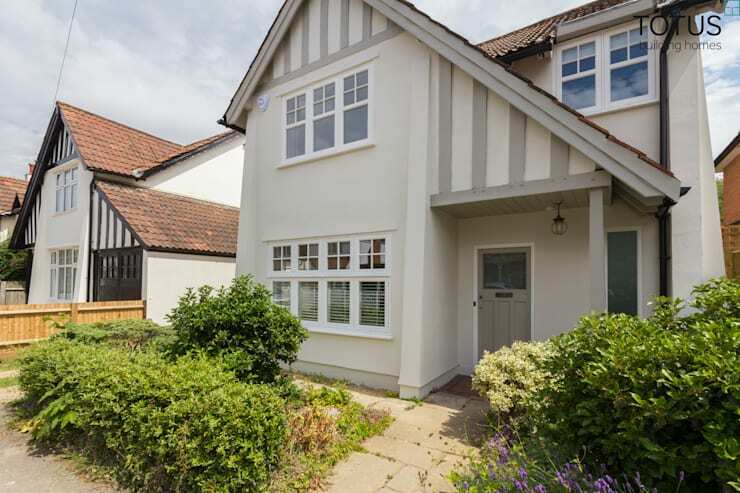 Take a look at what this period property looks like now! It's clear from the offset that this house has been modernised, with a great amount of care taken to show the property in its best light. The pristine grey and white façade alludes to its heritage, with the pitched roof and recessed porch typical to 1920s homes. However, the white walls and muted grey tones are contemporary and conform to current design trends. The English garden is quaint and sprigs of lavender break up the greenery, which decorates the space. The modern extension leads onto a practical and stylish decking area, perfect for summer barbecues and relaxing in the sun. The new addition blends perfectly with the original architecture and the design is clearly sensitive to the history of the home. The open-plan living and dining area leads off from a sleek, modern kitchen, which is sure to be a pleasure to cook in. 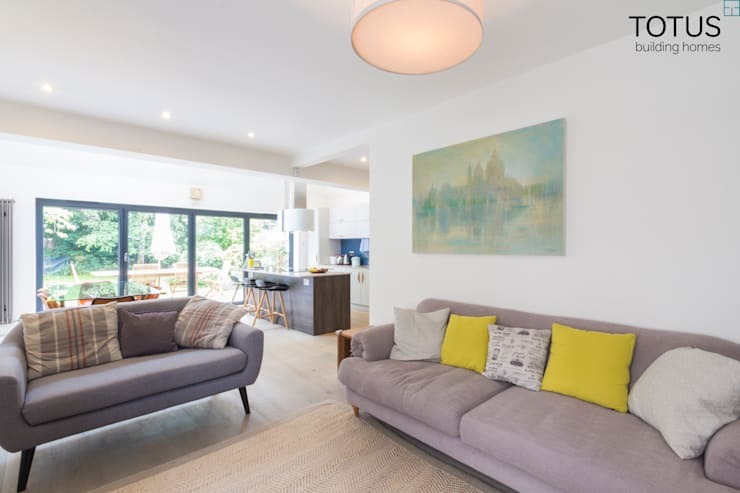 Part of the new extension, this stylish family space encompasses everything one could possibly need to hold a big family dinner or keep guests entertained and well fed! The white walls and ceiling provide a blank canvas, allowing for various soft colours and shades to be introduced, creating a homely and contemporary look. The glass dining table perfectly complements the modern design whilst also contributing to the illusion of space thanks to the light-reflective surface. The living room has been decorated in a simple, modern style that reflects the tasteful grey and white exterior. The positioning of the suite allows for a feeling of intimacy to be established without the need for dividing walls, so the 'room' feels cosy despite the open plan. It's thanks to this free flowing design that a beautiful view of the garden can be appreciated from the comfort of the sofa. From this perspective, you can see the glass patio doors, which open out to the garden and not only frame a pleasant view, but also flood the ground-floor with natural light. The neutral colour scheme continues in the second living room. The décor is restrained, with only a few ornaments on display. The furnishings are classic and elegant but the bamboo lamp is a quirky modern touch that introduces some vibrancy. The mint green ottoman and matching cushions also work to break up the blocks of white that dominate the interior. There is a continuity in the design, with the mint green colour playing a role in the hallway as well as the second living room. 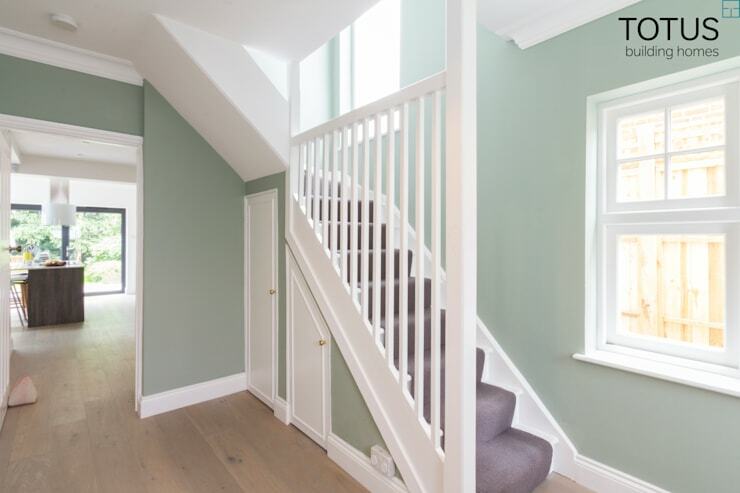 The traditional balustrades have been painted white and pale skirting throughout ensures the space looks clean and light. Who wouldn't love a bathroom like this? The room is light and welcoming and we can easily imagine spending a chilled out evening in this luxurious bathtub. 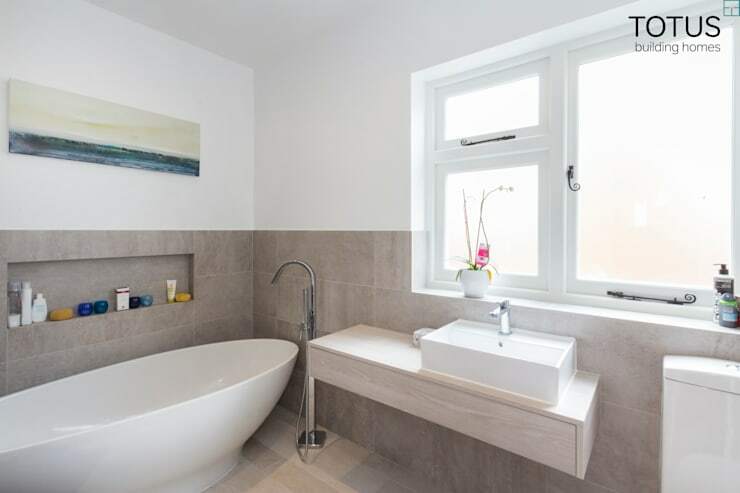 The grey stone tiles look stylish but are also a practical choice as they are easy to clean and much more resistant to steam and water than painted walls or wallpaper. A nautical themed painting hanging above the tub is the perfect finishing touch! To tour another beautiful British period property, check out: The unexpectedly sublime home. 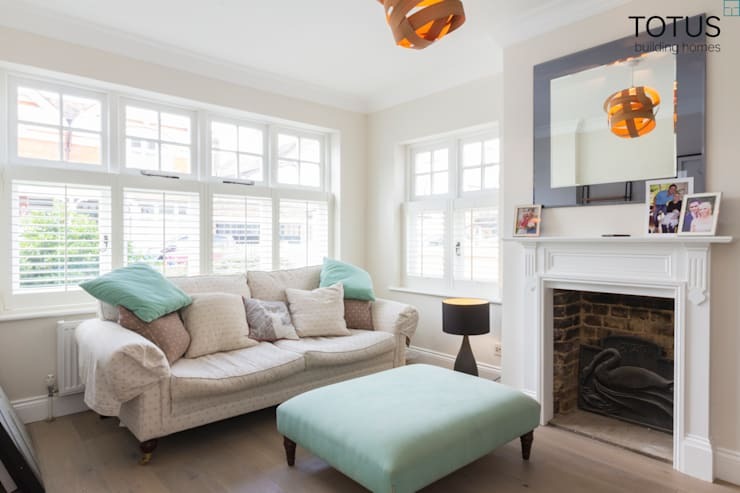 Did you like how this period home was updated?